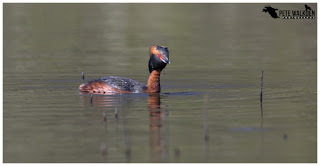 As the breeze subsided, the rustling of the reeds that lined the shore of the loch was replaced with the excitable trilled calls of little grebes, pairing up for the breeding season. In the distance, small pockets of snow, not remnants of the winter, but from a recent fall clung to the hilltops, in areas shaded from the spring sunshine and warmth from it. The waters of the loch calmed, and reflections of the surrounding trees took shape on the surface, some bearing new green leaves, others still biding their time for spring to arrive for certain, but decorated with lichens able to thrive in the clean, fresh air. A rise in temperature allowed one of the mute swans sitting on eggs in the reed-bed to shuffle out, and glide gracefully back on to the loch; time to stretch its wings before up-ending, reaching down to the bed of the loch in search of food, its rear end pointing skywards, taking on the appearance of a feathery iceberg perhaps. 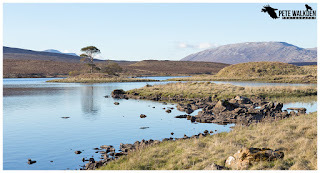 Sitting as low as I could beside the edge of the loch, I tried to drink in the tranquility and beauty of the morning. The air was filled with bird song, from the resident linnets and goldfinches, to newly arrived sedge warblers, and the distinctive call of a cuckoo, very much the indicator of spring. Overhead the chatter of swallows caught my attention, and I watched in awe as they swooped down to pick insects from the water, or to scoop a small drink from the surface. 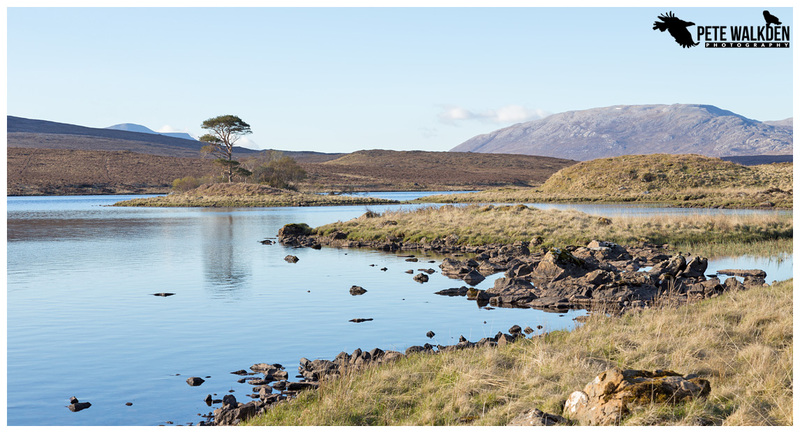 I was in Scotland again, and was hoping to photograph a stunning bird that uses these freshwater lochs in the Highlands for breeding. 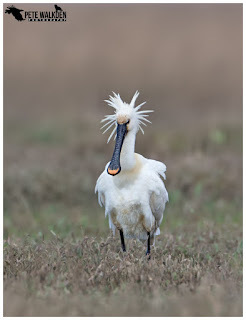 While I had missed most of the courtship dances, I was within a window of opportunity to get images of them, in breeding plumage before they began to nest. Their call, similar but slightly quieter than that of the little grebes, burst from the reeds nearby, and I held my breath. A glint of gold caught my attention, and then that ruby red eye. A Slavonian grebe had emerged from the reeds, and was busy preening for a moment, before scanning the area, and immediately diving down for some food. 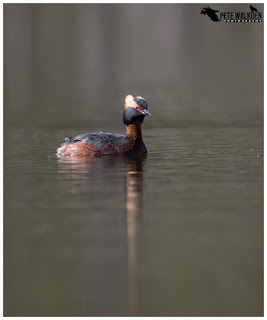 They can stay submerged for quite some time, and are able to cover a fair distance underwater too, so it’s very much pot-luck if the grebe surfaces near you. Mostly they didn’t, following a familiar route out into the loch each time, only varying it should something such as the swan or one of the coots be in the way. Sometimes only one grebe would appear, but when both did, I have to admit I was crossing my fingers hoping for a dance. 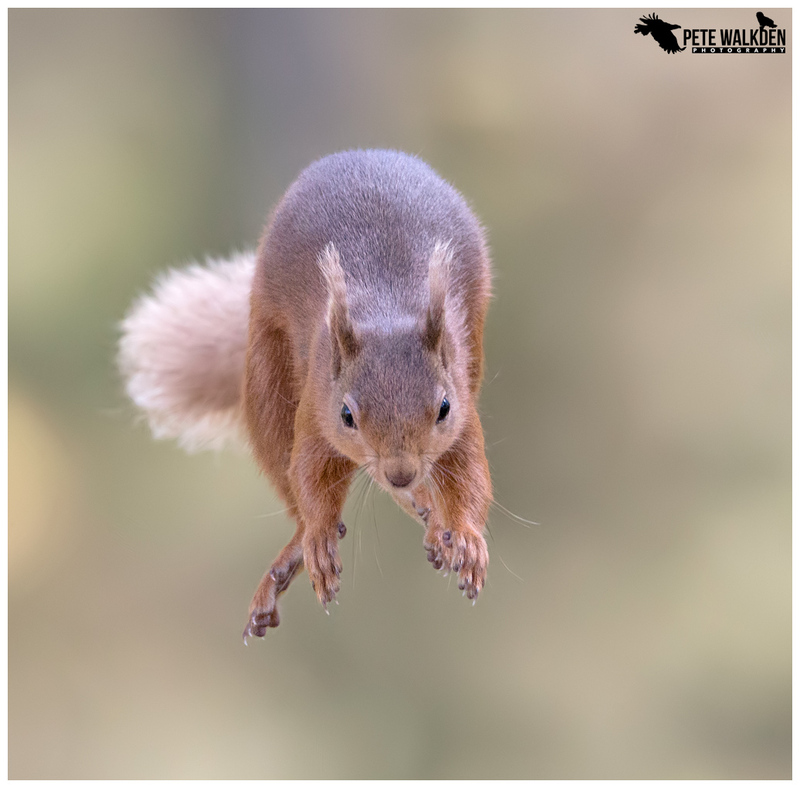 As with last year’s trip to the Highlands in May, this one wasn’t really planned - a last minute decision and one that happily coincided with some free time Andy had, meaning we would be able to spend some days out together enjoying the wildlife. That said he had to prepare for an exhibition, so we had some tasks to address, and I also chipped in with some maintenance around his red squirrel site. 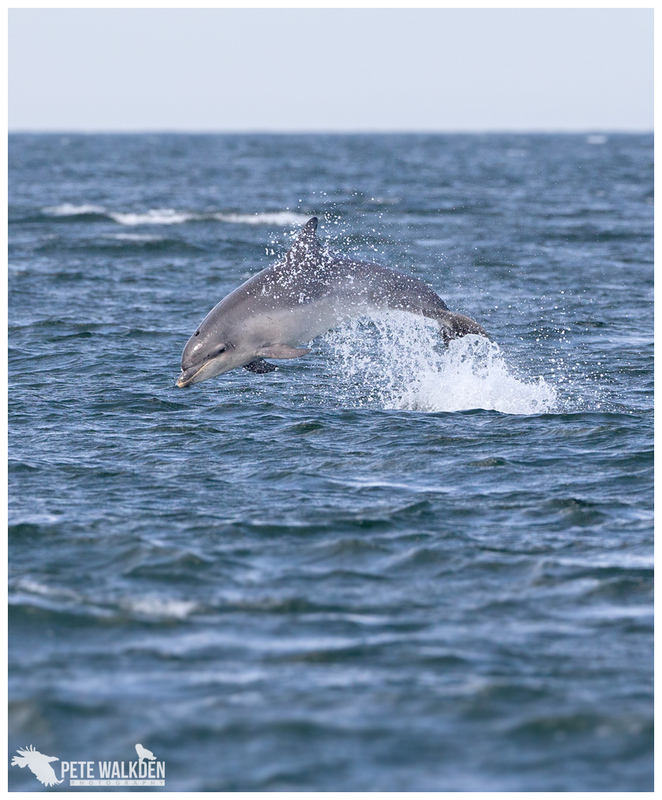 Chanonry Point was the target on a couple of days, as there had been some unseasonable activity from the bottlenose dolphins. When I arrived, most of the action had calmed down, but for once I did manage to get a breaching shot, something that has all but eluded me despite several visits. It was good to catch up with other friends up there too; the banter and laughter helped distract us from the freezing wind that was cutting through us on the shoreline. 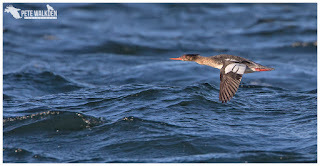 Aside from the dolphins, the beach offers great views around the Moray Firth, and we watched oystercatchers, common scoters, terns, gulls, sanderlings, ringed plovers, mergansers and eider ducks passing by. Some offering better photo opportunities than others, which was welcome when the dolphins were failing to put on a show. 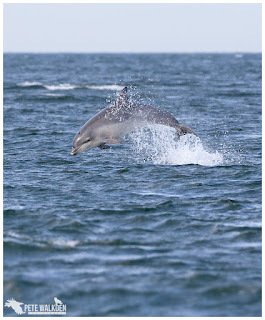 Lyndsey would be able to accompany us at the weekend too, and she suggested a trip out to Handa Island on the Saturday. I’d never been before, so jumped at such an opportunity. 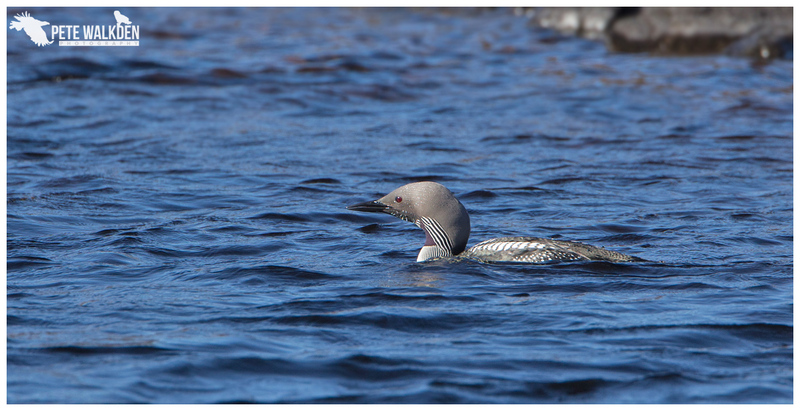 The drive across the Highlands was spectacular and I kept an eye on all the lochs for signs of any birds, especially hoping to see black-throated divers; another bird that uses freshwater lochs for breeding. What I hadn’t expected to see though, was a trio of common cranes circling over the hills! While I was relatively surprised to see them there, both Andy and Lyndsey were thrilled at the sight, and hastily parked the car up for a better view. Not a bad start to the trip. The crossing to Handa is quickly dealt with, in a small dinghy boat which lands on a white sandy beach. After a brief introduction to the place from the volunteers, we set off along the paths in search of skuas. 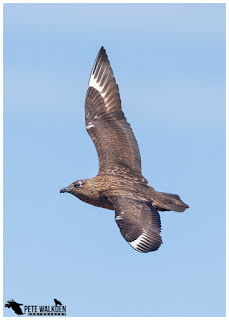 Andy had promised me views of both great and Arctic skuas, though the latter seemed in short supply. Bonxies though, were present in good numbers, and I settled down near a small loch where they were choosing to bathe. 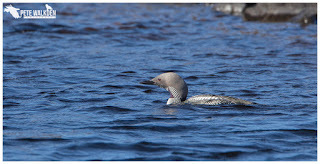 Bizarrely, amongst their numbers was a lone red-throated diver, which seemed to be sizing the loch up for somewhere to perhaps breed. It was testing the length of it for taking off, and tried from a number of spots around it, managing to take flight each time. Surely not the best place to bring diver chicks into the world, surrounded by predators? Both Andy and Lyndsey had wandered off, with Lyndsey choosing to complete the whole circuit of the island. I found Andy lying on his stomach taking photos of meadow pipits, skylarks and wheatears, which amused him somewhat that he was ignoring the stars of the island in favour of such common species. 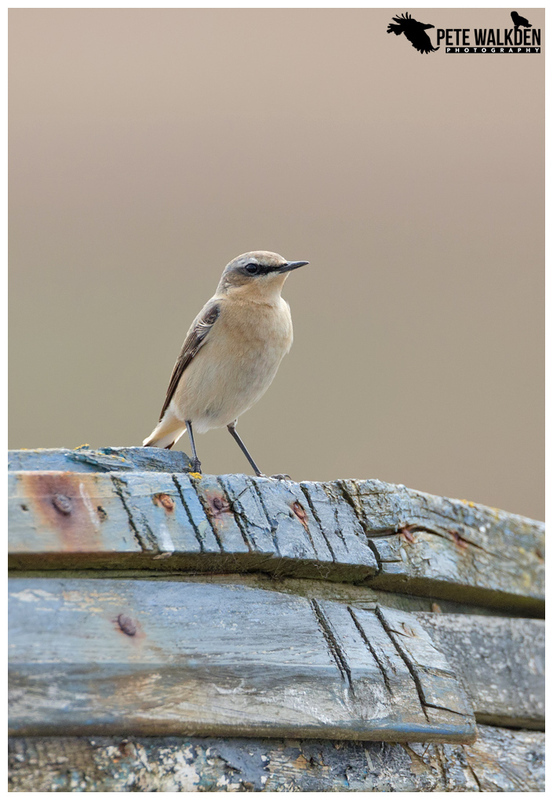 I joined him for a few moments before taking a brief walk along the clifftops, watching the fulmars floating on the updrafts or bickering at their nest sites. The views around the island were incredible though. On such a clear and sunny day, it was blissful to be there. Meeting up on the beach for the last boat away from the island we were soon back on the mainland, and we had just started on our journey back towards Inverness when we spotted a pair of black-throated divers on a loch. I was lucky in that they were on my side of the car, and I had my camera to hand. I took some shots as they drifted serenely across the water, but when they started to head towards the end of the loch, Andy decided to move the car along the road, and jumped out for a better view. I had barely opened the car door when I realised one of the divers had surfaced very close to where we’d parked, and using the door-frame for support, I was able to reel off a number of shots, capturing a sequence when the diver rose up out of the water to stretch its wings. 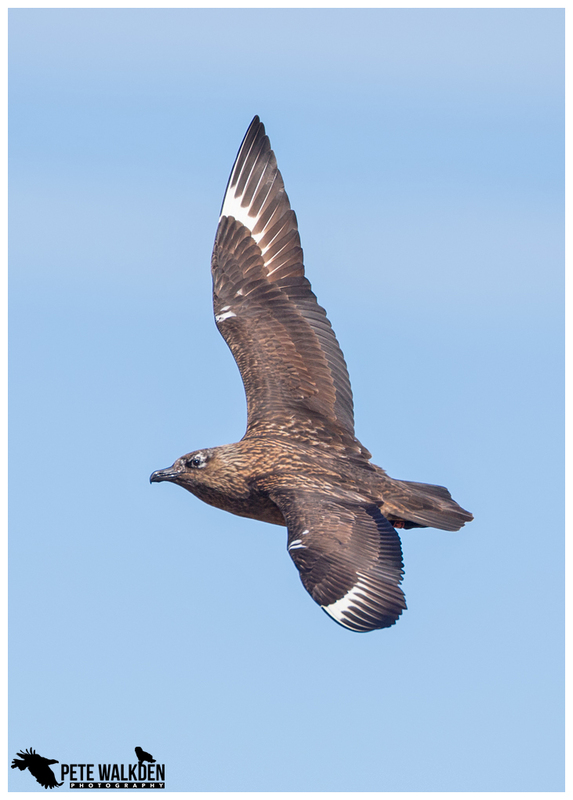 These birds have such intricate and clever markings on their feathers, perhaps evolved over time to mimic bubbles or streaks in the water when they dive and hunt for prey underwater? They also have incredibly good eyesight, and must have seen the car, as they soon dived, and appeared some way along the water again. We tried to follow, but soon realised it was a lost cause! Calling into Ullapool on the way back, we found a sheltered spot outside a restaurant and enjoyed dinner together, laughing about the day’s trip and planning what we might do the following day, though Andy had a client booked, so some of it was sort of pre-arranged. 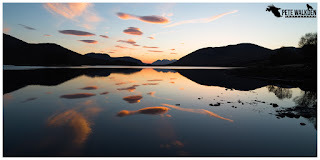 Lyndsey and I pestered Andy to stop off at a couple of lochs along the route home, to take some scenic shots, though he was forced to join in when the sinking sun lit up some clouds over one reflective loch, and created a most beautiful sunset scene. 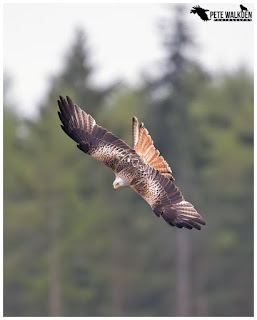 Thankfully there were plenty of alternatives, and after a coffee in Aviemore, and some indulgent shortbread, we found other subjects to point the cameras at, including red kites at the RSPB Tollie feeding station, a site that Andy and I had visited a number of times before. 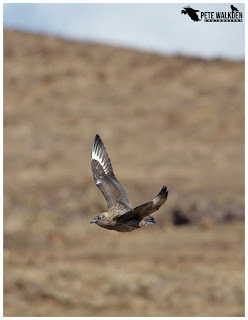 Unlike Gigrin, there are only a handful of kites that visit the site, and hence makes it much easier to isolate the birds as they dive for food. Andy and his client came away with fabulous images and, despite being unfamiliar with a 1DX, Lyndsey managed to take some stunning images of the kites swooping down for the food. But took some convincing, having been used to the extra reach of the 7D mk2 and its sharper LCD screen, that her images were as good as I suggested. A review on Andy’s iMac later backed up my assessment, and she started to see why both Andy and I rate the 1DX so highly. 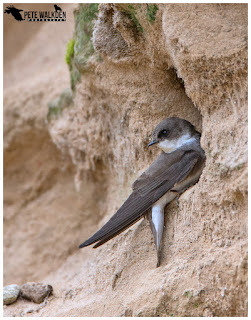 The working week began with Andy having to concentrate on final preparations for his exhibition, so I headed out alone and chose to visit a site good for watching sand martins. I’ve never really had too many opportunities to study these birds in much detail, but was charmed by how sweet they appear facially, especially as they peer out of the sandy burrows at the outside world. 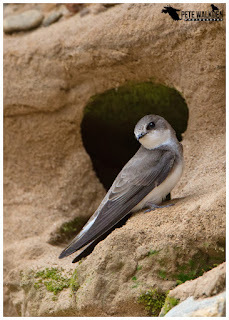 They were busy with bringing in bits of grasses to line the nests hidden underground, as well as kicking out sand that had fallen at the entrances. 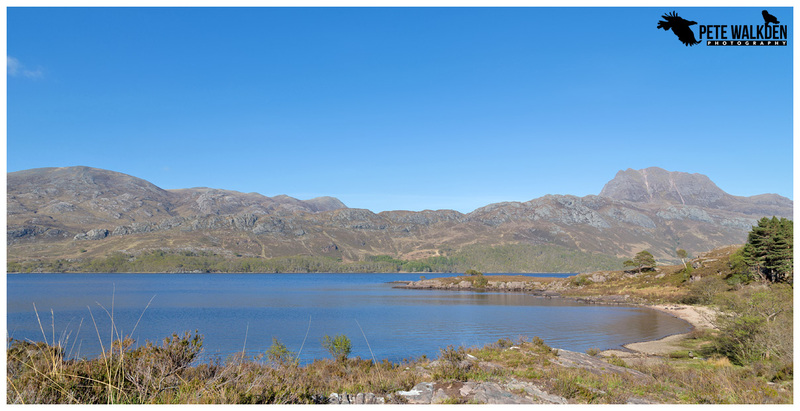 Looking at a map, I picked a few lochs along a road to visit, hoping for a sight of more divers, but the further along I drove, the better the scenery became. 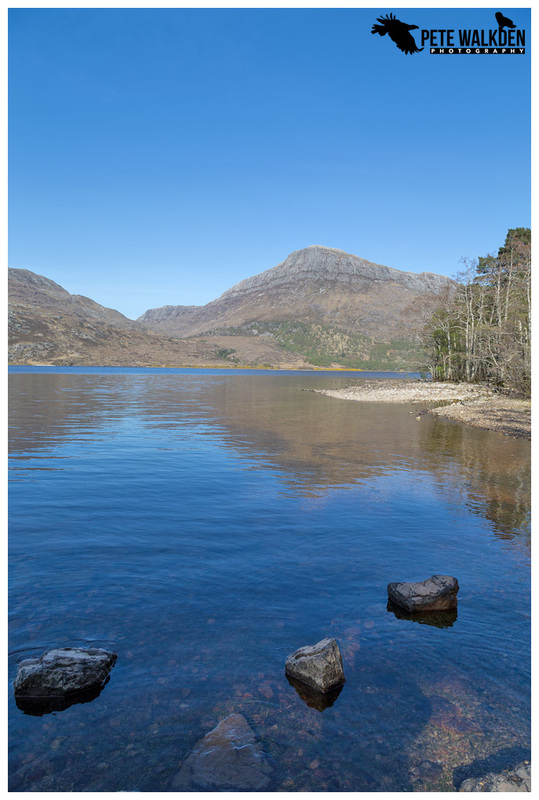 Just a short distance along the road, according to the map was Loch Maree, a location that featured in a wildlife documentary about a year in the Highlands. With clear blue skies, I couldn’t resist the opportunity to see it for myself. And boy was it worthwhile. Not so much for wildlife, though I did see a ring ouzel along the way, and a pair of black-throated divers, but for the scenery. Wow, just wow. 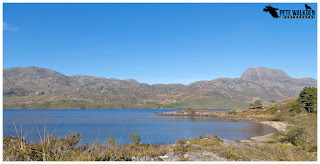 A friend from last year’s Mull tour calls this area home, and I can see why he loves walking around here so very much. It is simply stunning. The blue sky was reflected in the loch’s water, and thankfully for me, the midges hadn’t emerged in great numbers yet. My last full day was again spent alone. With bright skies and calm waters around the Moray Firth, I hoped the loch with the grebes would allow for some reflection shots. I was wrong, and a steady breeze kept the water’s surface choppy. 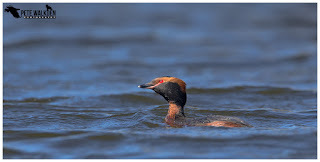 The grebes were still around, but I noticed a change in their behaviour. Instead of both birds coming out, or either one being out every 15 minutes or so, only one would appear, and would be out for much longer. 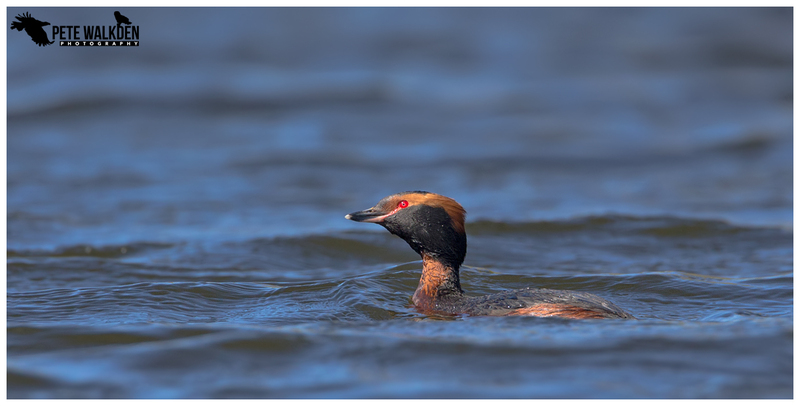 The grebes were also much more defensive of the area, and chased off anything they considered to be a threat. That was my cue to leave, as the window had closed, and nesting had begun. Hopefully it’ll be a successful season for them. As the day had warmed up so much, the heat haze had become a problem, and I chose to head back to meet up with Andy. He’d considered visiting the hares later that day, but all the effort of preparing for the exhibition coupled with the hazy light put him off the idea, and instead we visited Chanonry Point once again, calling in for an ice cream along the way. As before, the dolphins failed to do much at all, and a drop in temperature tempted us to head back to base again, for my last night of the trip. After saying our goodbyes, it was rather strange to wave Andy and Lyndsey off, as they left me at their house! They had to drop their two dogs off at the kennels before the trip for the exhibition, and I was still getting my bags together. 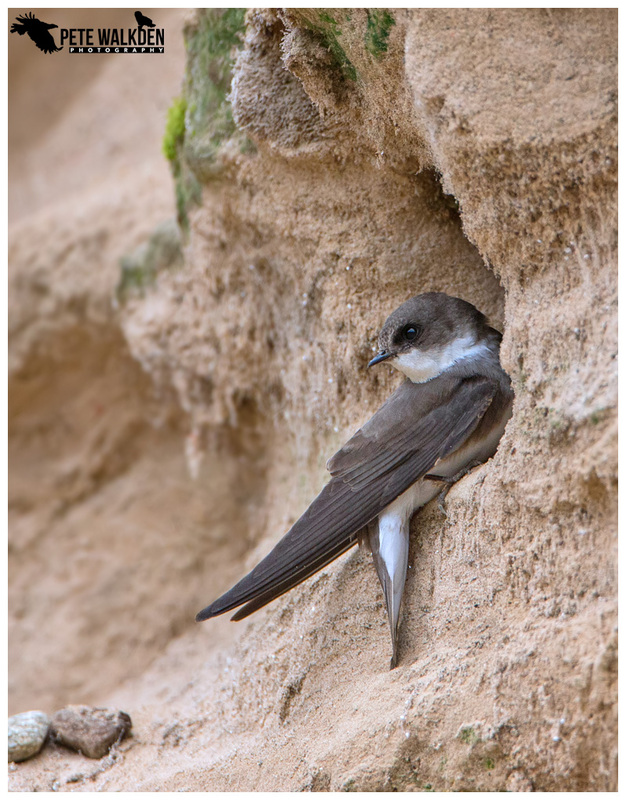 Rather than head straight back south, I broke the journey up with another visit to the sand martin colony, and after a quiet start, they soon started performing again. Perhaps the cooler weather meant they had to spend longer searching for insects. The second destination was Langholm Moor, in the hope of seeing some hen harriers. I did spot a couple of the ghostly grey male harriers, but only from a fair distance, and by then the heat haze was blurring the view, let alone any images taken. Plenty of other birds around, such as meadow pipits and skylarks, cuckoos and buzzards, and even a wild goat! A Spring Trip To Norfolk? Normally the annual trip east to Norfolk coincides with my Dad’s and my own Birthday, but Easter gatecrashed the party, so we had to delay the trip by a week. I had secretly hoped that this might break the cycle of us being there a week too soon for anything interesting to show up in terms of rare birds, but what actually happened was quite different. Winter made an unwelcome return during some of the week, and put an end to any ideas of rarities showing up as the winds were yet again from the wrong direction, mostly from the north, and bitingly cold. Still, at least I would be able to get out to see the resident attractions, and after recent years, I half expected to see barn owls each day. Not so. In fact the only opportunity I had for getting a shot was when I’d decided to put down the camera, and go for a walk, to relieve myself. 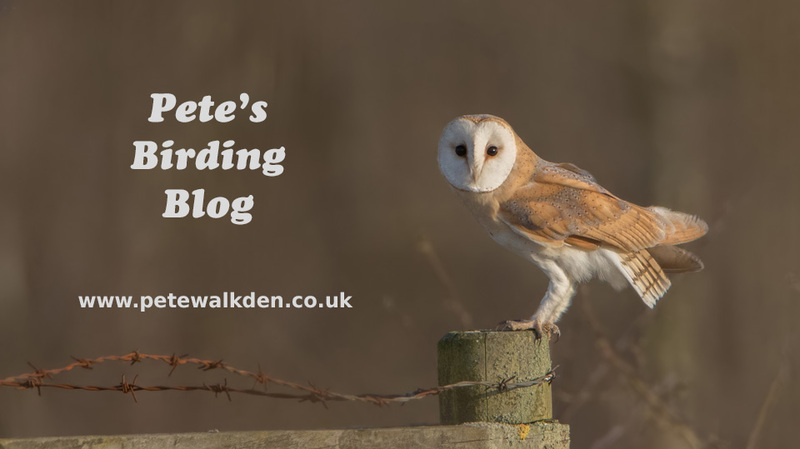 I was just zipping up when I caught sight of something white moving nearby, and a barn owl floated by, looked at me and landed on a fence only a short distance away. I backed off, scuttled away behind a wall and grabbed my camera. When I returned and I was pleased to see the owl was still sitting there. I lined the camera up, and it flew off. Damn!!! 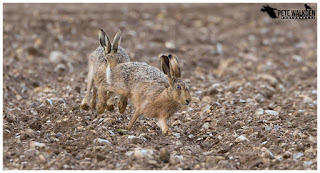 Brown hares were thankfully still plentiful, and my dawn drives around the lanes proved fruitful. 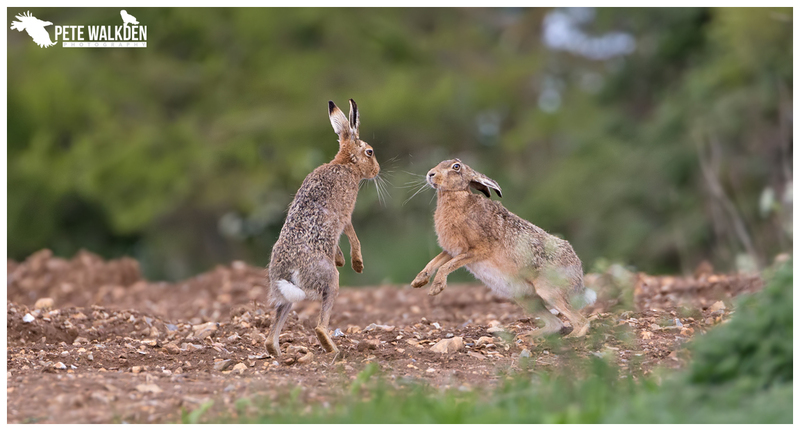 Despite it being late April, there were numerous boxing bouts going on, along with adrenaline-fuelled chases across the crop fields. 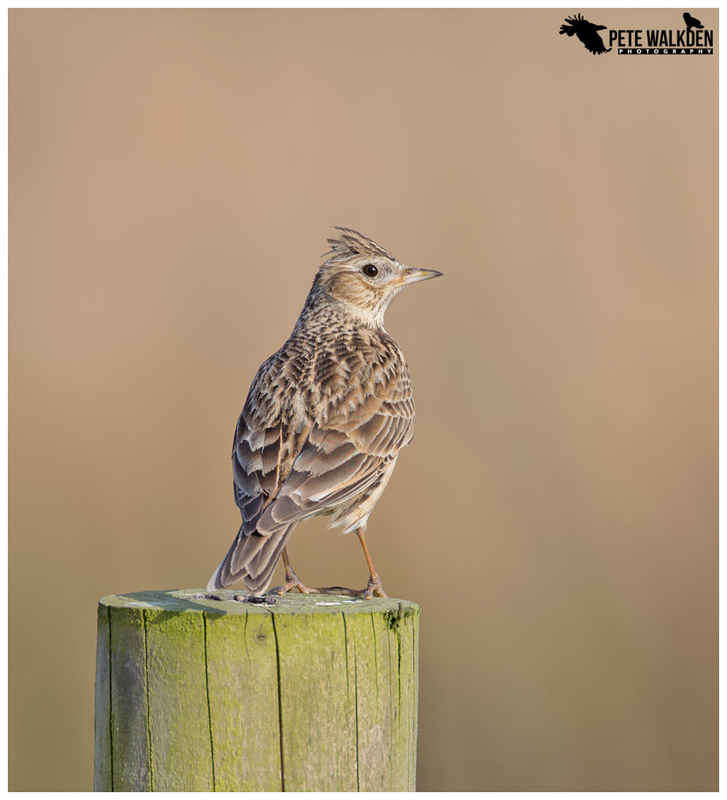 The females had a real job to fight off the advances of all the males, and one I watched in the shimmering light one morning, seemed to have accepted a pursuer, and allowed him to mate with her. 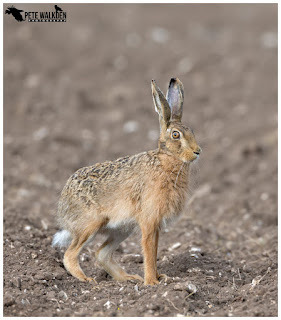 Now I was interested to see if brown hares have the same amusing trait as mountain hares when copulating, in that as the male reaches a climax, his ears shoot forwards. So do they? 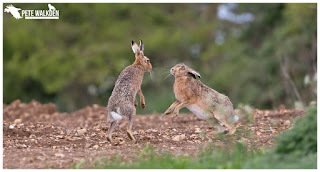 I can’t answer that, as just as that point in proceedings was about to happen, the female hare decided she’d had enough, and booted him up in the air! I burst out laughing - nature can be highly amusing at times. One pair of brown hares I spotted close to a convenient viewing point from the road seemed to be fairly content with one another, though each time the male tried his luck, he’d be put in his place. He was very defensive of her, and any other males that strayed too close were chased away. Being able to sit and observe these two allowed me to learn more about their behaviour. 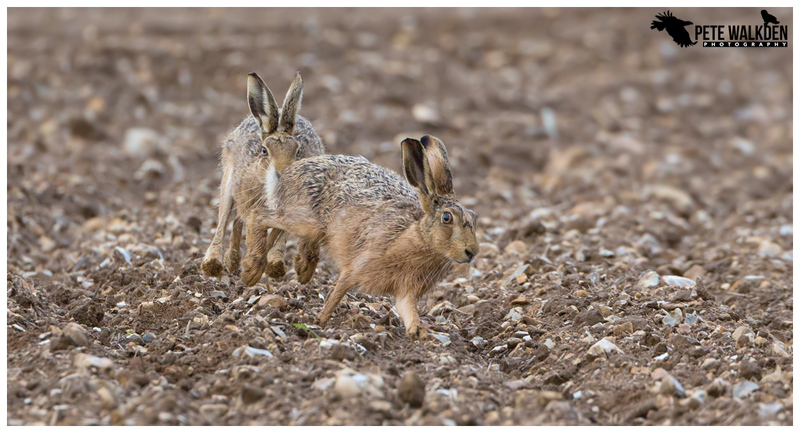 I was somewhat surprised to see these hares, like their mountain-dwelling cousins, eating their own droppings. 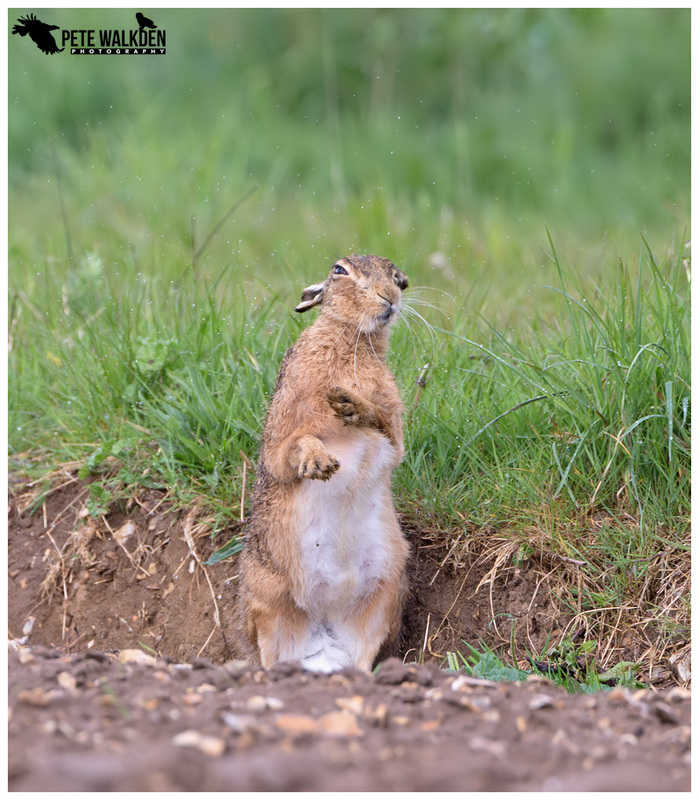 I understand that the mountain hares have to do this to get additional nutrition from the droppings, on a second pass, but surely the food the brown hares are eating is more nourishing? 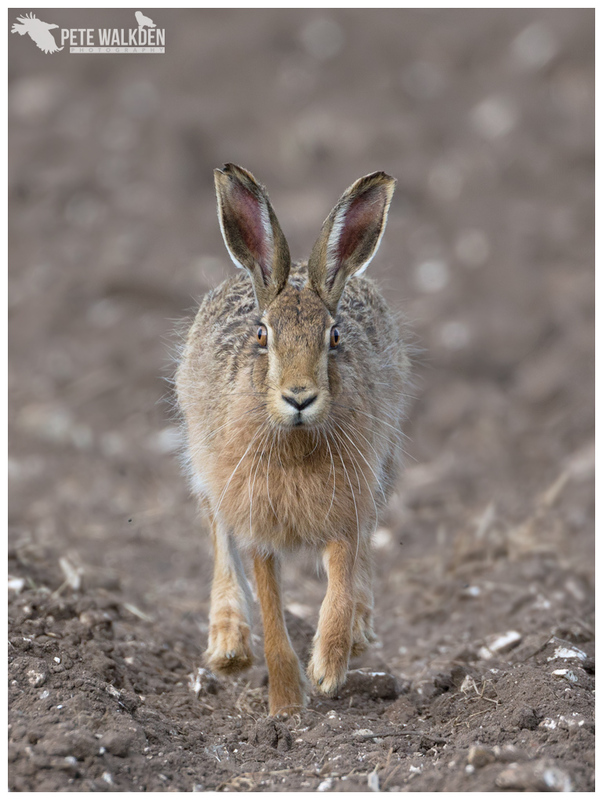 Also even more revealing was the sound made by the male hare. Every so often he would make a strange mewing call - hard to describe, a bit like a duck whistle. I wasn’t sure it was him making it at first, but with nothing else around, and watching him closely through my binoculars, I could clearly see the sound was coming from him. 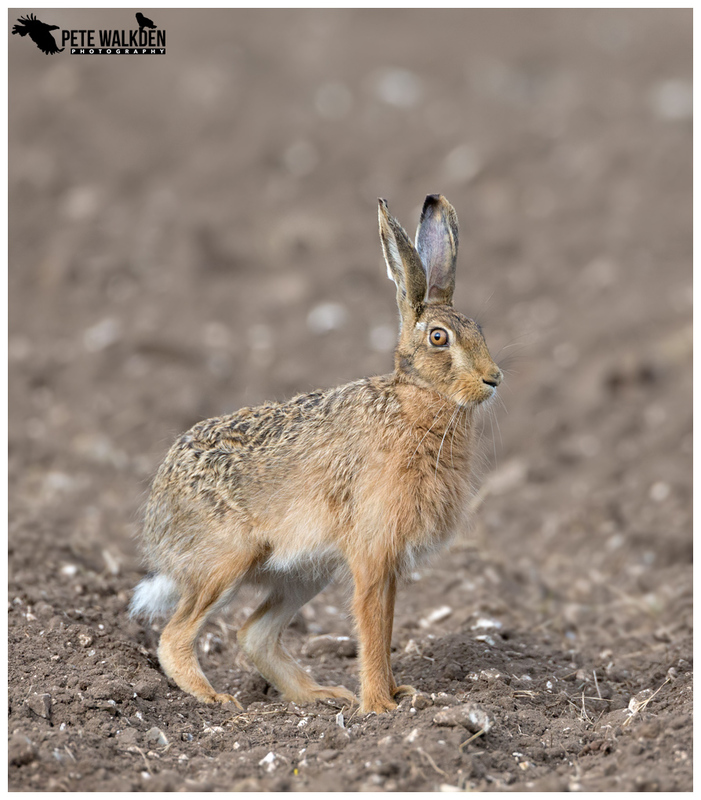 On one morning, the pair were sitting, as hares often do, almost motionless. There’s only so many shots you can take of something just sitting there. With the view through my new Kite binoculars being as sharp and clear as through my expensive camera gear, I also found myself watching them more this way - the view is certainly easier on my eyes. 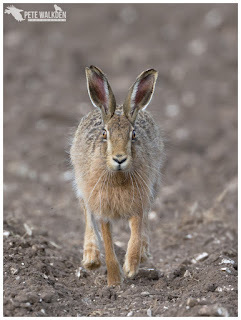 I wished it would rain, so as it might make the hares do something, anything! The skies behind darkened. My wish was to be granted. A short shower would be perfect. Lesson learnt… be careful what you wish for! Over the next hour, I saw rain, then sleet with flakes of snow, followed by a horrendous hail storm, thunder and lightning and a drop in temperature of about 10 degrees! The track I was on became a river of slush and hailstones. And yet the hares sat still, ignoring the grim conditions. When the weather finally moved over, the hares moved, and I was treated to them grooming, shaking off excess rainwater, and stretching. Two hares sitting beside each other. Both seemingly content with each other’s company. The male stood up, stretched and approached his partner. Perhaps he was hoping for a sign of affection from her, after enduring such horrid weather together? He inched closer and… soon backed away when she stood tall and raised a paw! Definitely a waiting game here! Another target when in Norfolk is the marsh harrier. 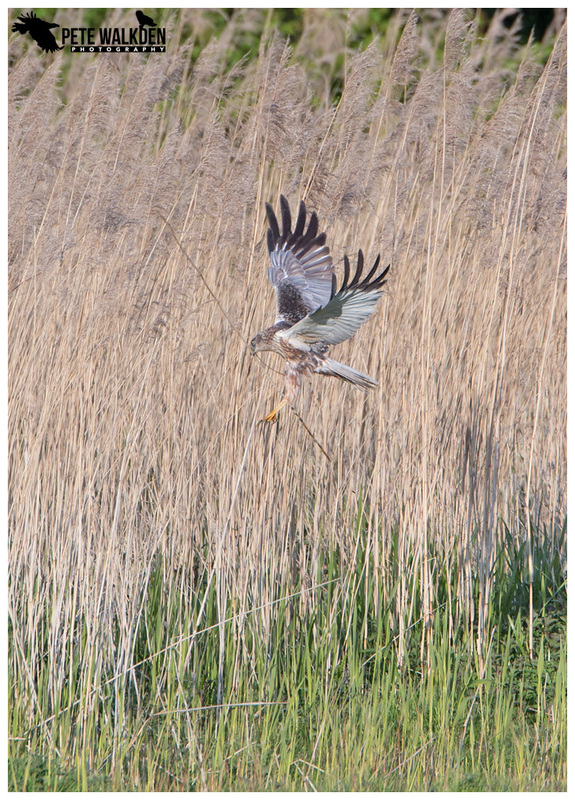 But as we were a bit later than usual, the birds had already paired up and the females were on nests, deep in the reed-beds. At least the Wherry ale was still present, and we made sure we sampled it each evening (and the occasional cheeky lunchtime pint) at the fabulous pubs around the area. I have to say that the meals in the Bowling Green Inn (Wells-next-the-Sea) are superb. Such a homely pub too, and of course Wherry on tap! And the sandwiches in the Dun Cow at Salthouse are worth the trip too. Ghost Ship on tap there as well as Wherry. What a dilemma! 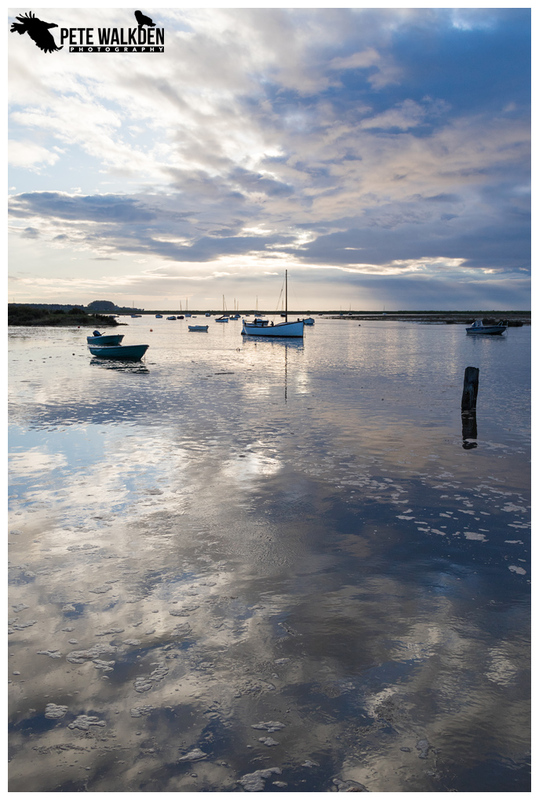 I often go to these locations (Norfolk, not the pub) with a preconceived idea of what images I will return with, and of what subjects, but more often than not, I come back with something else entirely. And true to form, this was the case once more. On one warm afternoon during the week, I decided to go for a stroll around the marshes at Burnham Norton. 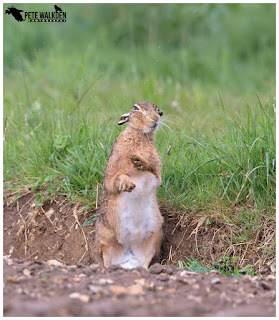 I popped the camera on the monopod, to travel light, and set off on the circular walk. I was about a third of the way around it when I spotted a different-looking bird feeding in one of the creeks. 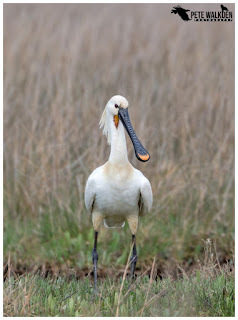 A spoonbill! To get closer, I had to retrace my steps back and continue along the coast. 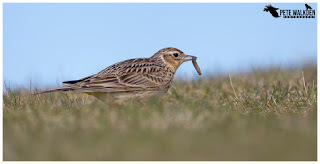 Was worth it to try to photo one of these birds, especially as it was in full breeding plumage. Just as I thought the spoonbill was approaching me, it decided to relocate to elsewhere, and I had to face facts it had been a wasted walk. Or was it? 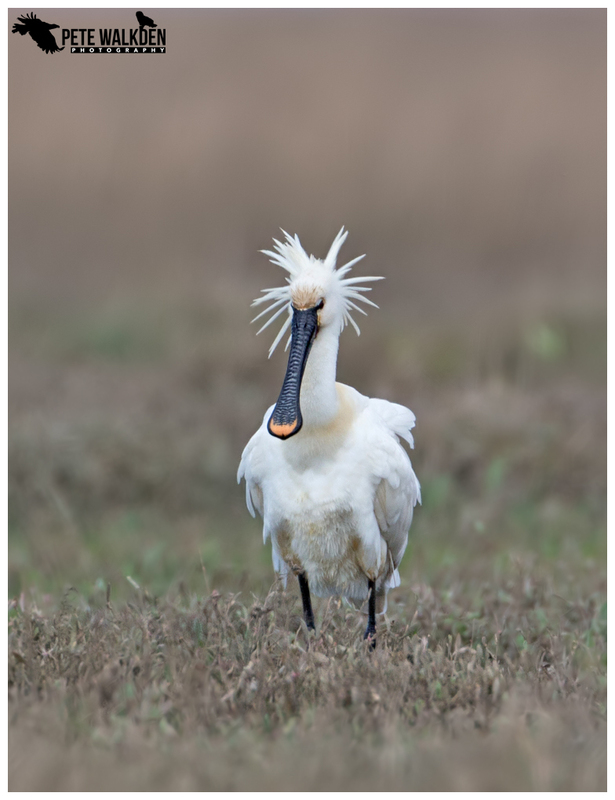 As I returned to the original route, I clocked the spoonbill feeding from a small pool beside the raised pathway, and by approaching on the other side, out of sight of it, I was able to peer over and grab some shots. 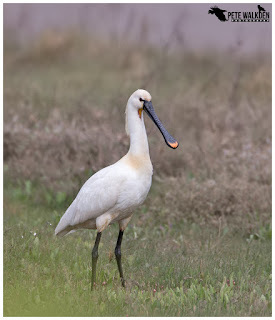 Again the spoonbill then decided to fly away, and again I followed it. Which became a theme for the next hour or so. At one point, I was only a few yards from it, as it fished in a shallow creek, and I crept along, hiding in gorse bushes. Funny looking birds, and ungainly when seen next to the elegance of a little egret. And even funnier when they decide to ruffle their feathers up! When the spoonbill flew further into the marshes, away from any pathways, I had to give up the pursuit, and head round the route back to the car, and a very patient father, who was sitting enjoying some spring sunshine on a bench. On the way I stopped beside a small pool to photograph a group of avocets, and enjoyed their antics as they chased each other, running and splashing through the water, occasionally taking flight. On my return, I was curious to see how far I’d walked, and my iPhone app reckoned I had covered 4.5 miles chasing the spoonbill. A long but very worthwhile walk. 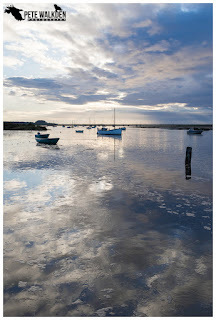 Of course visiting North Norfolk isn’t just about the wildlife. We both love the scenery, and that was made more dramatic with high tides and stormy skies. 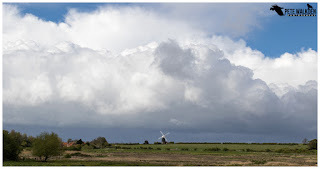 Watching the clouds build and roll in behind a windmill was something to behold. Alas the cold winds meant we didn’t get the chance to visit the Sculthorpe Mill pub, which is somewhere very special to sit outside on a warm day. Perhaps next year? As we left Norfolk, we diverted to Cambridgeshire to catch up with old friends who have recently relocated there. They’re renting a gorgeous, secluded cottage which may yield some wonderful encounters with wildlife, and if there are any owls there, I might have to find a reason to call round again. Back home, and I had to pack my bags once more, as I was heading north… to the Highlands again, but that’s for another blog post.